Almost simultaneously, two prominent San Antonio arts organizations announced the appointment of new executives to lead them into the future. 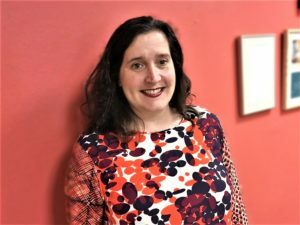 The internationally known artist residency nonprofit, Artpace, promoted its longtime studio director and recent interim director, Riley Robinson, to the top position of director, while the literary group, Gemini Ink, did something similar by appointing its interim executive director, Alexandra Van De Kamp, as the new executive artistic director. A highly respected artist, Robinson has been affiliated with Artpace since before it opened its doors on N. Main Ave. in 1995. In fact, he helped founder Linda Pace to conceptualize and design the program “as a laboratory of dreams,” as the website says. Each year, Artpace hosts three residency periods, each involving three artists – one from Texas, one from elsewhere in the U.S. and one lucky person from anywhere in the world. Since 2001, the participating artists have been chosen by invited guest curators. Their only task is to generate new ideas and create “bold new works” which are then exhibited at Artpace. Needless to say, artists love it. Though the organization has seen at least four different directors come and go in the past 6-7 years Robinson says he is here to stay. “I am excited about the future and I think I know what we need to do to secure that future,” he said. Top on the list is building an endowment to gradually become self-sufficient and bring the dependence on the Linda Pace Foundation to an end. 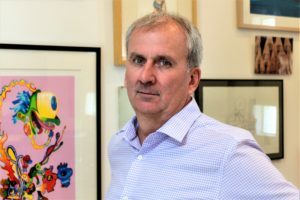 He also expressed confidence that the current board, led by gallerist Patricia Ruiz-Healy, will provide the necessary leadership and support. The board recently added five new members, including two former Artpace resident artists, Cruz Ortiz and Margo Sawyer. In addition to residencies, educational programs and other exhibits, Artpace has added a few new things to benefit San Antonio artists and the public. A recently instituted program that brings well-known contemporary art curators to San Antonio to learn about the San Antonio art scene, is likely to enhance our city’s national and international reputation in the art world. And Robinson’s recent experience in Iceland has spurred another change. During his and his family’s recent visit to Iceland, Robinson was annoyed when they could not get to see the famous “Library of Water,” a glass-and-water installation in the small coastal town of Stykkisholmur. It was closed the day the Robinsons passed through town. “I decided that that was not going to happen here,” he said. From now on, Artpace will be open and free to the public every day of the week. Now celebrating its 25th anniversary, Gemini Ink is well positioned to consider its future as well. The author of two books of poetry, Van De Kamp previously served as the literary programs director at Gemini Ink, and has served as interim executive director since Black left five months ago. Gemini Ink’s programs include a range of writing classes and workshops led by established writers; a community outreach called Writers in Communities, and the summer Writers Conference which takes place in July. Additionally, its Autograph Series presents famous writers in free public readings which are supported in part by a ticketed luncheon with the visiting luminary. The list includes Margaret Atwood, Grace Paley, Edward P. Jones, Luis Alberto Urrea, and Philip Levine, among others. The 2019 guest will poet Terrance Hayes, the 2010 National Book Award winner for poetry. The new director is adding online classes as well as hybrid ones that would allow interested individuals from other Texas cities to participate, ultimately gathering with the instructor and classmates for the final session at Gemini Ink. And there is a new service for writers who may not have a good work place or don’t want to be at home while working. For them. the center has created a co-working space on its premises that can accommodate four people for a very small fee. Founded by writers Nan Cuba and Marylyn Croman, the organization is marking its 25th anniversary on October 18 with its signature fundraising event, the Inkstravaganza Gala, but with a twist. While the annual shindig usually features a single prominent author, this time all previous Inkstravanganza honorees will appear together for a grand celebration.